Play Doh is one of those things that is memorable for many of us. There are plenty of different activities you can do with Play Doh, and it’s such a useful learning tool for kids of all ages. A month after my daughter turned two, she developed a fascination with Play Doh. Other kids at her daycare were playing with it—so why couldn’t she? When I did a search for Play Doh sets for two year olds – I came up a little short. We have reviewed the best Play Doh sets for 2018 in great detail below, and but we also included a quick list of our top five. If you don’t have time to read this now, PIN IT FOR LATER! There are affiliate links in this article. You can read more about this in my disclosure. You can load pretend food such as muffins, cakes, and pizza. After putting the food in and pressing down the lever, the white light on the oven will turn to red and ding when the food is done “baking”. An oven, five pretend food attachments, three cutters, knife, fork, spoon, roller, plate, and six cans of Play Doh. My toddler has a fascination with the oven (probably not a good thing! ), so this allows her to experiment with cooking in the oven like mom and dad do. There are lots of different food and decorating options. Most parents report that their kids love this little oven. They love the option to bake their food and some parents report that it’s one of the best Play Doh toys they have ever bought! Some parents reported that the oven either didn’t work, or that they were unable to close the oven door. Here’s a video if you want to see it in action. This all in one creativity table includes everything you need if you are starting out with Play Doh. This table had half-mold shapes built into the table, as well as extra storage space for your new (and old) Play Doh supplies. I found this set while I was doing research for this article and I was SO excited that I bought it immediately. We received it – and I can say it was DEFINITELY worth it. It gives my daughter a clean space to play on, has some ample storage space, and includes a wide variety of cutters. Parents love the storage space and feel this is a great Play Doh starter set. Some parents stated that they were missing pieces when the product arrived, and others claimed it was challenging to put together. Roll, squish, and squeeze your pretend breakfast food with this fun set of tools. A waffle, toast, eggs, bacon, and veggies mold. It appears to include extra molds such as berries and butter. Also includes a plate, spatula, fork, knife, and five cans of Play Doh. This set is so much fun to play with, and is one of the few complex Play Doh sets that is fairly easy to clean! My daughter is still young, but breakfast food is her FAVORITE (she lives for oatmeal, cereal, and pancakes), so she LOVED playing with this set. I really struggled with finding a con about this product, but there are other Play Doh sets that you can get for cheaper–so this may be a con for some people. Other parents have nothing but good things to say– except for a comment made that the product is a little small. Overall, I don’t think you can go wrong with this Play Doh playset. My daughter was TERRIFIED of the dentist. This Play Doh set help her overcome her fear of the mystery man with the drill. It also allows for your child to practice real world skills – like brushing their teeth. Overall this product has great reviews. The drill is a big hit for most kids, and it seems to help more than just my little one get used to the dentist. Some parents stated that they did not receive all of the parts, so definitely keep an eye out for that! This video is for a different version, but the product is very similar. This set contains everything you would need to feel like you were in a real bakery! This Play Doh set for toddlers allows for the fun of decorating cookies without all of the sugar. This Play Doh set includes: Four cookie cutter shapes (heart, star, circle, and square), textured rolling pins, tray, 2-piece extruder, spatula, and five cans of Play Doh. If your child is anything like mine, they LOVE helping in the kitchen and are fascinated by all things sprinkles. Your child will get their baking fix and have an opportunity to explore their creativity with the different decorating options. Parents say this set is good for all ages and is a budget-friendly option. Some parents state that the containers of Play Doh are a little small, but overall this seems to be a well-loved set. This is one of the ONLY Play Doh sets for two year olds that I was able to find. 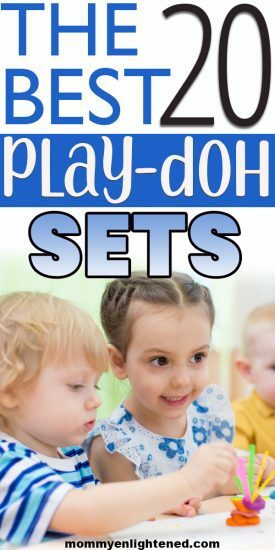 This Play Doh set includes activities that promote early language and literacy skills by creating settings,plots, and characters with the tools and playmats provided. 14 themed cutters, two double-sided playmats, rollers, a Together Time Guide, and six cans of Play Doh. This is one of the only play doh sets for two year olds.. It’s super affordable and promotes your child’ sensory-motor development in a FUN way. There really are no cons to this product, and if you have a two year old I would totally recommend picking it up! Other parents love the good value and multitude of shapes and colors included. Some parents felt that it was not anything special, but I think it’s a great price for what you are getting. Grow legs for Cranky the Octopus and add cute little designs on his legs. The treasure chest and clamshell have various molds (such as pearl rings and gold doubloons), as well as additional book and half-molds on the coral reef textures. This Play Doh set includes: Octopus playset, treasure chest, lobster scissors, clam & goldfish book-mold, dolphin rolling cutter, texture roller, and five cans of Play Doh. I love that this set contains scissors! This is a safe way to help your child practice pre-writing skills and learn about scissor safety. It also encourages the use of your child’s imagination more than some sets do. My child is obsessed with fish, so she loved making fish molds. Parents love the crank that is used to make the octopus legs and say it offers their children hours of fun. Some parents feel that the crank is a little difficult to use at first, and others state that it’s difficult to clean. Your child can play chef while cooking on the stove with this Play Doh set. This cute toy for kids includes plenty of fun kitchen utensils and a variety of food stamps and molds. A stovetop, four stampers (eggs, steak, burgers, and fish), two plates, two pans, tongs, spatula, fork, knife, and five cans of Play Doh. The actual stove does have some half molds of side dishes like broccoli and carrots. I am a HUGE fan of most of Play Doh’s kitchen creations, and this set is no different! This set is particularly fun because my daughter gets to use utensils like the spatula and tongs (which are great for motor skill development). There are various sound effects when you are flipping and playing around with the stove. Most parents agreed that this set was fun and a little unique in that you aren’t pushing the Play Doh through anything like you do in many Play Doh playsets. This product had VERY few one-star reviews, but it seems that a parent or two feels that there are too many small pieces for this to be considered a good Play Doh set for two year olds. This Play Doh set is a great learning tool to help your child practice their ABC’s, spelling, and counting! This Play Doh set includes: 26 letter molds, nine number molds, a plastic knife, and 8 one-ounce cans of Play Doh. May be difficult to find. On Amazon, it’s only available as an “add-on” product at the time of this writing. If your toddler is at an age where they are interested in Play Doh, it’s probably getting close to the time they need to be learning their numbers and letters. These Play Doh molds make it fun to get familiar with the alphabet. Not to mention it’s SUPER CHEAP!! It’s pretty hard to go wrong with a toy as simple as this, and the majority of parents agree. Some parents felt that the letters were too small, but the overall response to this product was positive. If your child loves Doc McStuffins, this Play Doh set is a must! Your child can create bandages, use an assortment of doctor tools, and use molds to create Lambie, Stuffy, and Hallie. Doc McStuffins figure, clinic base, cardboard backdrop, bandage crank, couch, bed, Lambie, Stuffy, and Hallie book-molds. It also includes a doctor bag, knife, scissors, and four cans of Play Doh. My daughter loved her small doctor kit that we purchased when she started using the potty (yay no diapers!) She loves Doc McStuffins and so this is a toy she can play with for hours because of the easy role-playing she can do. My daughter was a little frustrated with the bandage maker, as it was a little difficult for her to use. Many parents loved this product for their young toddlers. The molds are very detailed, and kids enjoy making the bandaids. There were very few negative reviews, but a couple of parents felt it had a poor design. With this kitchen creation Play Doh set, you can make creative cakes that feature confetti and colorful swirls of Play Doh frosting. Your child can shape pretend cakes with the oven or cutters. This Play Doh set includes: an unassembled playset, five different cutters, decorating tool, two plates, a spatula, knife, fork, three cans of Play Doh confetti and two cans of regular Play Doh. My two year old LOVES to pretend cook for us, so this Play Doh set is a lot of fun for her. There are a ton of different molds that come with the set, which means endless combinations! Most parents agree that their children love this set and stay entertained for much longer than a typical toy. Some people complained that the package arrived in an unmarked box instead of the standard yellow Play Doh box. Definitely pay attention to what you are ordering if you buy this, as it seems to default to the boring brown packaging! This princess Play Doh set allows you to make dresses and accessories such as glass slippers and roses for your favorite Disney princesses. You can open the castle area to create a ballroom, and each of the princesses can fit inside one of the book molds. The castle, base, three princesses (Belle, Cinderella, and Aurora), three princess door molds, a prince door mold, a tower presser, and six cans of Play Doh. Seriously, what’s not to love?! This Play Doh set is unique and gives your child the opportunity to play with REAL princesses! Each princess has three different accessory molds included so your little one will have plenty of options. If your child loves Disney, princesses, and molding things with Play Doh, they will really enjoy this set. Some parents felt that the price was a little steep for the product, and others complained that it was flimsy and did not stay together well. This is a huge Play Doh set with the box measuring almost two WHOLE feet in length! It consists of a variety of tools with a dessert theme. 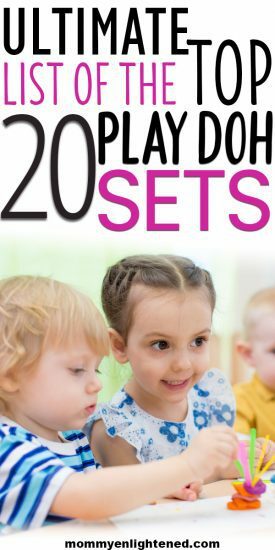 What we love about this Play Doh set: This set is excellent for play-dates or parties, as it is definitely a much larger set than one kid needs. This set is somewhat different than other large Play Doh tool sets (such as the Fun Tub) because it contains a larger variety in types of tools in the kit. This set seems largely unpopular, but the very few reviews that exist are positive. I imagine the cost is off putting to a lot of families. This is one of the most expensive Play Doh sets available without offering something exceptionally special about it. This Shape N Slice Set is a little less extravagant than some of the other options offered from the Kitchen Creations line. This set is meant to help your child “prepare” food but cutting and molding. It provides a multitude of different tools that can help encourage open-ended play. Food half-molds (see picture), and a variety of kitchen instruments such as scissors, two knives, fork, cheese grater, spoon, bowl, and six cans of Play Doh. Most Play Doh Kitchen Creations come with one “big” item, so the fact that this is a bunch of little things could be a con for some people. We love utilizing kitchen tools with our daughter. Not only do these help strengthen hand muscles and fine motor skills, but learning to use kitchen utensils is a practical skill to learn! The vast majority of parents loved this product, finding it both affordable and entertaining for their toddlers. There were very few complaints, although one customer believed they did not receive all of the parts. This Play Doh set allows your child to give the most creative hairstyles possible at the Crazy Cuts barbershop. To use this product you fill the characters with Play Doh, put them in the barber chair, and crank the handle to grow out colorful hair. Unassembled playset, three characters, two book-molds, four accessories (including scissors), and six cans of Play Doh. It seems like little kids (toddlers especially!) have a strange facination with cutting hair–so this toy gives them the ability to do so safely. Personally, my child had just as much fun playing with the little people the set comes with as she did the Play Doh! Lots of parents remember a similar product from when they were kids, and this set does NOT disappoint (with the exception to a few who felt it was flimsy). The biggest complaint about this toy set is that it is so difficult to clean! Create multiple swirls of Play Doh ice cream in this Ice Cream Castle. You can alter the shapes and styles of the ice cream swirls by switching out the ice cream discs. It comes with an easy press handle to help squeeze out the ice cream and includes a variety of things to help you decorate the ice cream with sprinkles. Unassembled playset, six ice cream discs, four dishes, two cones, five spoons, roller, and six cans of Play Doh. I wouldn’t say that we LOVED this playset. It was one of the first Play Doh sets I got for my two year old, so we didn’t have a lot to compare it to. Although my toddler thoroughly enjoyed it, I found it incredibly difficult to clean and somewhat flimsy. Many parents report that their child is entertained for hours with this product. I also found that many parents were a bit disappointed in this product for a few reasons. First, you must specify if you want “frustration free” packaging, which is where the playset comes in a plain or cardboard box, or standard packaging. Frustration-free packaging seems to be the default (like a similar product above). Pay attention to this if you are planning to order it for your littles and want it to arrive in a spiffy pretty box. Other parents also agreed with our issue, that the product is difficult to clean and somewhat flimsy. The Play Doh fun tub comes with twenty pieces (cutters, etc. ), and a storage tub to keep everything in. Roller, a knife, three stampers, twelve cookie cutters, and a two-piece extruder with rail. It’s so difficult to keep your child’s small toys organized and together, so the storage container makes this product worthwhile. Also, you can turn the lid upside down to use as a Play Doh surface to play on! Overall, this item is a big hit with parents. They love the low price, variety of shapes, and storage capacity. There are a couple of users who felt that the size of the playdough that came with the set was small. Packed with tons of tools and can packs to offer all kinds of creative play with different types of pasta noodles. Your child can simply choose a disc to change the shapes of the noodles they create. Mac and cheese is my kiddo’s FAVORITE, so of course, she loved this Play Doh set. Honestly, it’s cute, easy to use, and allows for open ended play. This Play Doh set is a huge hit for most kids. Some parents state that the levers wear out easily and there are numerous complaints that it may be a little flimsy–although there were some parents who have owned and used this set for years. This basic Play Doh set is a classic. Your child can squeeze ten different shapes from this silly pressing machine, then squish, smoosh, roll, and mold their creations into anything they want. Two cans of Play Doh and two shape making rails that change the shape of the Play Doh in ten different ways. This Play Doh set for toddlers is a clear win for my toddler. She loves how versatile it is, and it’s a toy that she can stay entertained with longer than most. The lever is easy to push down and great for strengthening hand muscles! Most parents agree that this set is a staple for your household. The most common complaint is that there are so many crevices and it is difficult to clean; however you can snap the pieces apart and clean it fairly easily. Your child can make the cast from My Little Pony series with the four different molds to create each type of pony: Earth, Pegasus, Unicorns, and Princesses. You can make cutie marks, rainbow manes, tails and more with the half-mold palette. Four different pony bases, pony book-mold, half-mold palette, 2-piece extruder, and nine cans of Play Doh. Difficult to mold the Pony properly–this was a BIG con for a lot of people. Although getting the mold to look nice takes a bit more work, it’s still a fun activity to sit and do with your child – especially if they love My Little Pony. Most parents were thrilled with this purchase. It’s sturdy and a lot of fun for older (4-6 year old) children. The biggest complaint was that it is difficult to use for younger children. Play Doh is beneficial for many reasons. 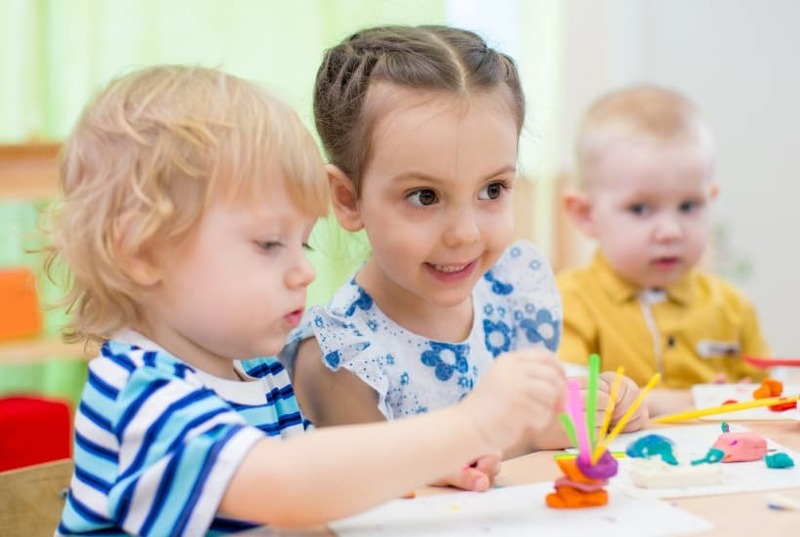 Not only can your child practice pre-writing skills from a young age (which is CRITICAL for Kindergarten readiness), but Play Doh promotes creative and academic growth. When we looked at the different Play Doh playsets, we considered how easy it was for your child to be able to use critical thinking in open ended play, as well as the ease of role playing. Some sets were a little limited in what they offered over a plain pile of Play Doh, so we did not include the majority of these playsets. We researched for you and scoured over reviews from other parents. Here we were able to discern common themes for different products and added both the positives and negatives that we were seeing from parents. Although at first glance an item may only appear to have four out of five stars, we found that some of the time these negative reviews were due to confusion with the seller–not a dissatisfaction with the product itself. In our personal experience, we have not experienced issues with durability in Play Doh products (my kids are pretty soft with their toys though!) There is some Play Doh sets that appear to hold up better with kids that are rough with their toys, so we considered the product’s durability when reviewing. Not only this, but certain products with handles and levers seemed to hold up worse than others, so this factored into their overall review. This is a BIG one. Probably more than half of the products we reviewed are hard to clean at varying degrees. We took this into account because I KNOW that as busy mother’s we just DON’T have time to spend an hour cleaning Play Doh out of crevices. Ease of cleaning was not a huge ranking factor, as we wanted to concentrate our review (mostly) on how much enrichment your child will receive from the product. Because most of my experience with Play Doh is with an (almost) three year old, we wanted to take into account Play Doh sets that are easy to set up and use without a parent’s help. This varies widely depending on age, so we looked more closely at which products required adult assembly or batteries to operate. Although these did not negatively impact the rankings, we noted it in the individual reviews as a con. The majority of Play Doh sets are surprisingly affordable, but sometimes this seems to limit the durability, ease of use, or learning and growth opportunities. We wanted to include some products that were budget-friendly but still provided good value. We did add a few higher priced items that offered something unique. We noticed quite a difference in the amounts of Play Doh that come with each set. Anything that came with more than four cans was a positive thing, and anything less was marked as a negative thing. I mentioned this earlier. We have a lot of experience with Play Doh sets. I am a mother who does a LOT of research before buying anything, but Play Doh is one of those things my family can’t get enough of. What is the right age for Play Doh? Generally speaking, Play Doh is usually safe for a two year old. They have most likely given up the obsession with putting everything in their mouth, which is a large part of the age recommendation. Play Doh is a choking hazard, and eating enough of anything can be toxic, so it’s essential that your little one is past the oral stage. I get really excited about my daughter hitting developmental milestones, which leads to my problem with buying toys for her before the recommended age (and let’s be honest – she ISN’T ready most of the time). She had a walker before she was crawling, a bike before her second birthday, and Play Doh sets when she was two. I am by no means recommending you give your two year old Play Doh sets recommended for older children, however, Play Doh playsets for two year olds are FEW and far between. Take the age recommendation as a GUIDELINE and not a rule. Every child can benefit from using Play Doh. It’s a great learning tool and is usually a solid budget-friendly option. Keep in mind that there is no such thing as Play Doh sets for boys or girls; all kids can experience the same amount of enjoyment regardless. What was your favorite Play Doh set? Were there any I left off of this list that you think should be included? I would love to hear from you in the comment section below!